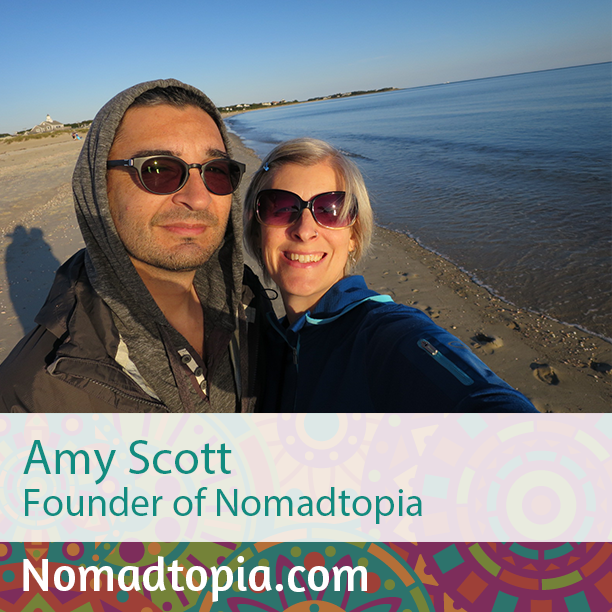 As the host of Nomadtopia Radio, I’m busy interviewing lots of other nomads and I don’t often have the chance to share more of my own background and experiences. So to celebrate Episode 60 of the podcast and the first of 2016, I invited my friend Jill Sessa (whom I interviewed in December 2014) to come on the show to turn the tables and interview me. Jill did an amazing job digging into the back story of how my own Nomadtopia came into being back in 2004, my early days as a freelancer, meeting my husband in Argentina, how we travel together, the pressure I sometimes feel to fit a certain profile or image as a nomad, and so much more. Meeting my husband! In 2009 I was just starting to get antsy in Buenos Aires and was thinking about moving on, when I went out salsa dancing with friends and met Roberto. I decided to stay put to see how things went. We got married in 2012 and have been on the road ever since. That location independence has become such a big thing. I guess I knew that telecommuting and the like was becoming more popular, but I didn’t expect it to turn into the movement that it has. On a more personal note, I’ve been pleasantly surprised that my husband and I are able to spend pretty much all day every day together without getting tired of each other. Hi Amy, I enjoy listening to your podcasts, keep up with the good work. However, I find your talking style a little long winded, it would be nice if you can speed things up and get to the point, it could be the talking style. But just used to the more fast paced podcast style. Thanks for listening, and thanks for the feedback. Love your show, and it was great to hear you interviewed and learn more about your journey and what your Nomadtopia has been like. I had been listening to other travel podcasts (and other types of podcasts), but yours was the first one that I haven’t found the host’s style annoying after a while, and had to switch. I have stayed, listening to one after the other, since I found you! You garner so much practical advice from your guests and I love to hear all the different stories of these interesting people’s lives. I would love to hear more about VPN. I heard you talk about it briefly with a guest, but I’d like to understand what that stands for and what it actually does for you in foreign countries. I heard you mention Paypal, which will be important for my business, as well as Facebook, so I’m very interested in how this works. Is this a way to get Amazon Prime and other streaming of US movies, etc., too? I’ve mentioned it elsewhere, but I’m in the throes of getting my condo ready to put on the market (aiming for the end of the month), and then I’ll be moving to San Miguel de Allende. So cool that you’re there now, too. I hope you’ll still be there by the time I arrive, and maybe we could meet! Thanks for the kind words, Virginia! https://www.nomadtopia.com/dustinmain/ (in the Resources list of this one there is an article about VPNs too). Look forward to meeting up if we’re both in SMA at the same time—we’ll be here until July. Oh, thanks so much for the links to these two shows!